Hello, and welcome to Summer Vacation Militaria. My name is Karl Kithier; I am your host to my world of helmets, field gear, insignia and other militaria (aka junk). I put much thought into my website name. So many of the German type militaria names are very hard to remember if not spell. Imagine www.hauptluftwaffebekleidungsamptsudmilitaria.com no, I don't think so. I also thought about my Czech background with such names as Bohemian militaria, but then I would need to have lots of Czech militaria, which does not sell that well. So, here we are with Summer Vacation Militaria. I even simplified it for you to SVmilitaria. I hope you like it. I like it. As for me, I am a 35+ year collector of WWI & WWII steel helmets of the world, German WWII combat uniforms, equipment, insignia and weapons. I really enjoy German WWII camo helmets. I love most all militaria, and am always happy to talk "shop" with you about your favorite militaria category. I am originally from Prague, in the Czech Republic, and came here when I was 3 in 1968. I speak fluent Czech, but read and write it poorly. I have a BS in Marketing (public relations & promotion) from Wayne State University in Detroit, MI and an MBA from Central Michigan University. Some of you may know me as Wildandcrazyguyfromczechoslovakia on Ebay. I am running a one guy show here, with the exception of a friend who very rarely helps out. I do it all. I find it, photo it, describe it, list it, sell it and ship it. Oh yes, I do my best to return Email, but sometimes it all just overwhelms me. My goal is to sell original militaria @ a reasonable price, with a little bit of fun included. Feel free to call; the number is on the home page. As for the dog, Kramer, he is my ever present assistant. He has never eaten a Luger holster and does not sleep on Kriegs flags. He did partially chew up a WWII German Dresden city police patch when he was a puppy, but I am sure he was sorry. If it makes you crazy seeing him laying on a WWII flag while it is being photographed; he has done his job. I'm trying to make this a little bit fun. Kramer tries very hard to be the perfect assistant. If only he could make coffee. 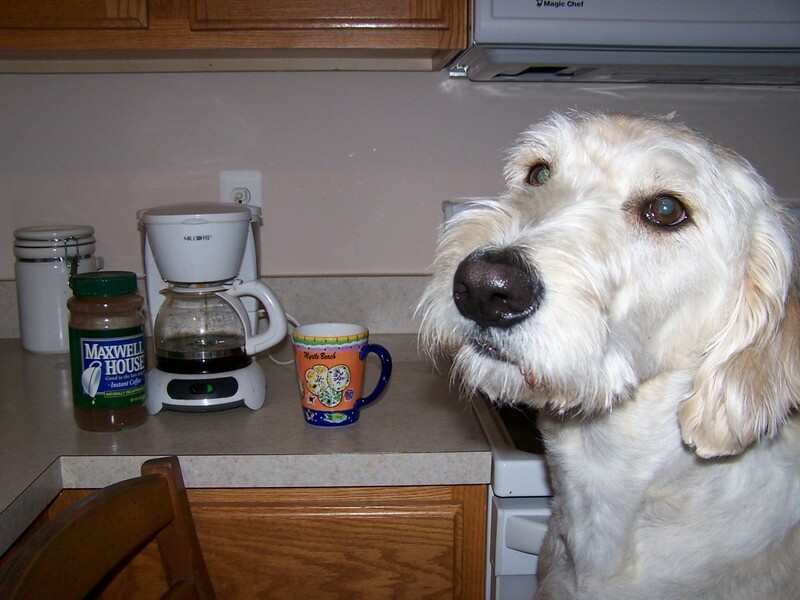 I tried to teach him, but he made decaf.